Two old red bikes, one American....one English. Both very dusty, rusty, with flat tires. After my wildgoose chase, time to get busy with...clearing out and organizing one of my garages. My garage landlord got the official edict from the powers that be in the city, that it is time to re-roof and make repairs to the garages. I won't get into a discussion of that, other than to say that both the landlord and I are not happy with the timing of all this. But, as I said, they are the powers that be. This particular garage is one that I shared with someone else at one time. A lot of stuff in there was, shall I say abandoned and left for me to deal with. Enough said about that... 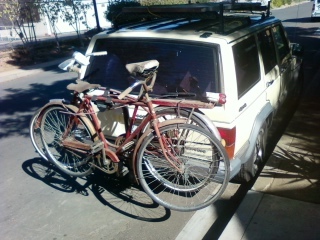 But there are some neat things to be found, like these two bicycles I pulled out today. I remember SFB saying she was a fan of "Pushbikes" as they are sometimes referred to over on the other side of the big pond. After a bit of scrubbing and rust removal, both bikes don't look half bad. The American is a "Skyrider Deluxe" by AMF, the bowling alley people that owned Harley Davidson for awhile. From my web searches I believe it dates between 1958 and 1962. It might have had a tank type light on it at one time. The accessories it sports now are all NOS stuff I found at an old Raleigh bike shop that is long gone now. Well, they were NOS when I purchased them...It's all a bit over the top, but keeping with that era. This was a bike I'd ride to the local ice cream shop with friends of mine who would also ride their old bikes. Been years since we've done that. Alfonso, the main instigator moved out of the area. He's got a real nice BMW R69S and a couple of Morris Minors. The English bike is according to the web, a lower priced alternative that Raleigh offered. Raleigh bought the Robin Hood bike works. Interestingly, there is a "Robin Hood Harley" dealership in Nottingham. Have no clue the year of the bike. Most of the pics on the web are of three speed models. Anyone out there have a clue? Both bikes have acquired nice patinas with age. The Robin Hood has a nice faded candy red, turning sort of orange. The AMF is loosing big chunks of color and is going silver...Think I'll leave them that way. Filled the tires up and rode both of them, of course the tube in the AMF lost pressure, but considering how long it's sat it didn't surprise me. Another bike I spotted in there was an old Indian bicycle circa the fifties I imagine. Might drag it out tomorrow. Anyone have any ideas on what to treat the leather on the Brooks saddle with...? Larry try some Neats Foot oil on it and let it soak in or some saddle soap. Either may do the trick. The AMF bike looks like something outta the 50s with those rocket looking things (taillights?) on the back. Back when every car had tailfins of some sort. A Robin Hood bicycle, that takes me back. I remember the brand from when I was a teenager back in the early 70s, when everyone rode a bicycle. Most kids I knew rode old bicycles inherited from relatives or their fathers, so 50s bikes were fairly common. Can't remember anything specific about a Robin Hood, but I probably knew someone with one, (I had a BSA and later, a Triumph). As mentioned, you could try neats foot oil or saddle soap on the saddle, but don't expect too much. The Brooks saddles fitted to cheaper British cycles were terrible, you'd think they were made of cast iron! I'm emotionally (if not physically) scarred by riding on them! We used to replace them with French or Italian made plastic saddles as soon as we could. As for age, I would estimate 50s, but it could be anywhere from the end of WW2 to the mid 60s. No doubt there's some club out on the Web that could help. Love the rearlight on the AMF, when I was 15 I would have loved one of those! After having a second look at the saddle, it does look pretty thin like Norman says.....like the old tractor seats, just a metal base with no padding of any sort. Luckily I guess back then people didn't travel very far, a few miles at most each way, to get somewhere....work, pub, town, etc. This saddle has just the leather attached to a sprung base. I found an old can of neatsfoot oil left over from the old all leather hiking boot days. Also have something called "Properts all purpose cleaner & conditioner...and water repellent", left over from the reptile cowboy boot days. I reshaped the leather while it was soaking wet from the washing. As soon as it dries out I'll try the oil and water repellent treatment. Probably not as comfortable as a modern mountain bike seat, but definitely looks vintage.